"Cures Start Here" visitor center entrance. Three structures hold the illuminated titles on one side, with artifact cases on the reverse. The "Share Your Story" photo booth was made from an inexpensive off-the-shelf system. The "Share Your Story" graphic wall panel with "I'm here because" response cards. Sweeping perimeter wall, featuring hundreds of response cards from visitors. World map graphic showing the breadth of the the research work around the globe. Visitors can select from a range of video testimonials on a tablet to project. Perimeter wall graphic for "Share Your Story." 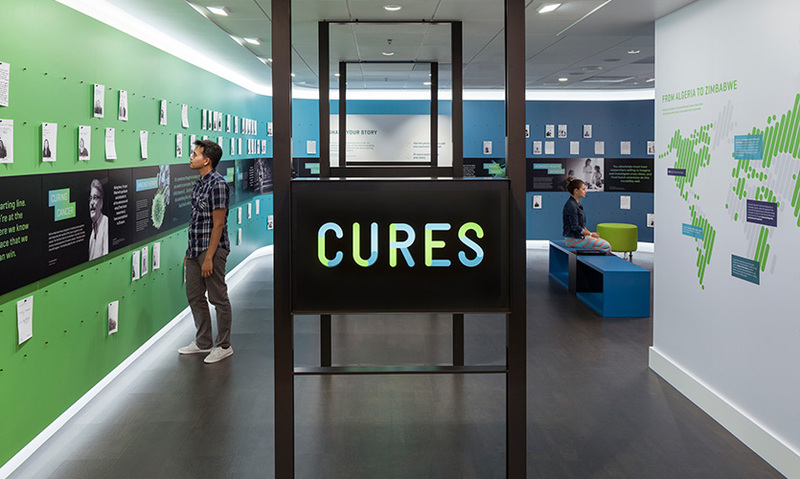 This first-ever visitor center for the globally-recognized Fred Hutchinson Cancer Research Center was carved out of a defunct, 550-square-foot credit union space on the Fred Hutchinson Cancer Research Center campus. 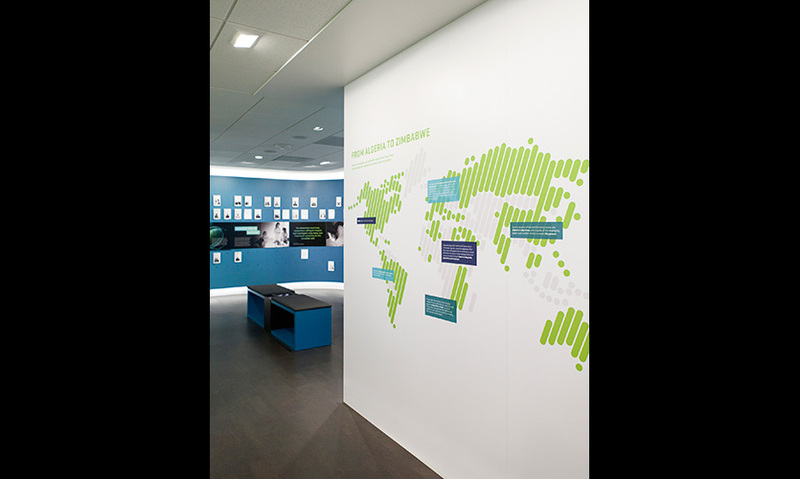 The challenge was to take a small budget and a tiny space and establish a brand new visitor center to tell the inspiring Fred Hutchinson Cancer Research Center story. The intent was to create a welcoming, informative and inspiring space for a diverse audience of benefactors, patients, researchers, employees, and visitors to the Seattle campus. “Watching some of the personal video testimonials the Fred Hutch team had collected from cancer survivors and the scientists racing for a cure, it was incredibly inspiring. We knew we had to find a way to allow people to contribute their own stories within the space. Seeing the walls already filling with those stories has been deeply moving,” remarks Kristine Matthews, lead designer at Studio Matthews. The scope covered the full design of the space including three-dimensional design, graphic design, and liaising with the client on all content development. Also included were selections of artifacts for inclusion, and oversight of fabrication through final installation. Studio Matthews started out with a shoestring budget and a small, pokey former credit union space. Yet within the tucked-away, low-ceiling space, they could see there was potential. Walls were knocked through, an underutilized reception area was appropriated and a back exit was closed to help form a space that, though still small, created a dramatic and inviting experience. 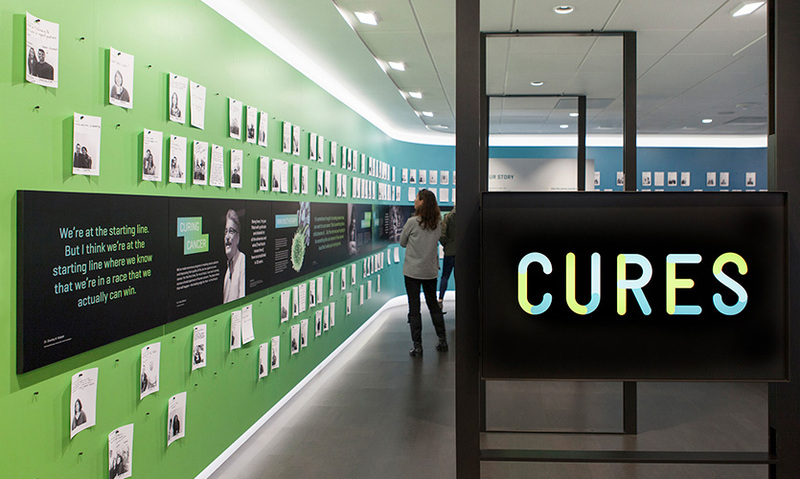 Cures Start Here—the first-ever visitor center for the world-renowned Fred Hutchinson Cancer Research Center—was designed to support people winning the fight against cancer in the community and around the globe. The exhibition spotlights the Center’s Nobel Prize-winning science and reveals the direct link between research and saving lives. 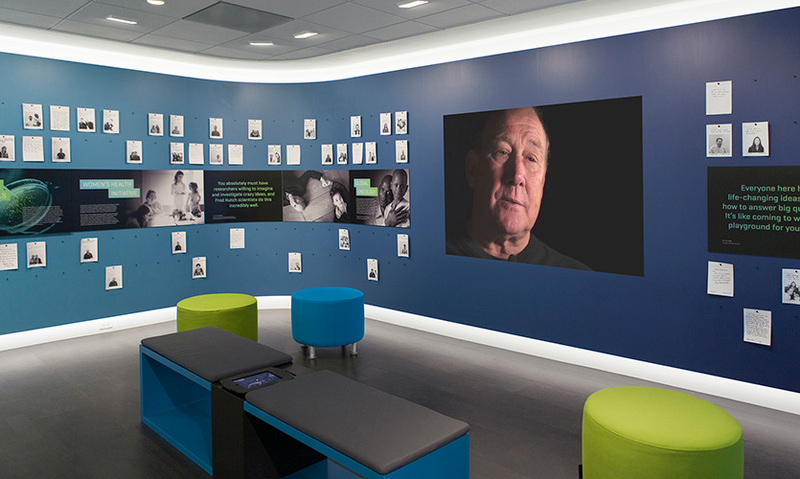 Artifacts, graphic displays and compelling personal testimonials (both printed and on screen) combine to tell the Fred Hutch story. Pulling from the color gradients in the Center’s new brand, a bright green at the entrance transitions to a quiet navy at the rear, creating a tranquil place where inspirational testimonials can be viewed on a large projection screen. The design team created a “Share Your Story” photo booth by modifying an inexpensive, off-the-shelf kit typically used for wedding photography. 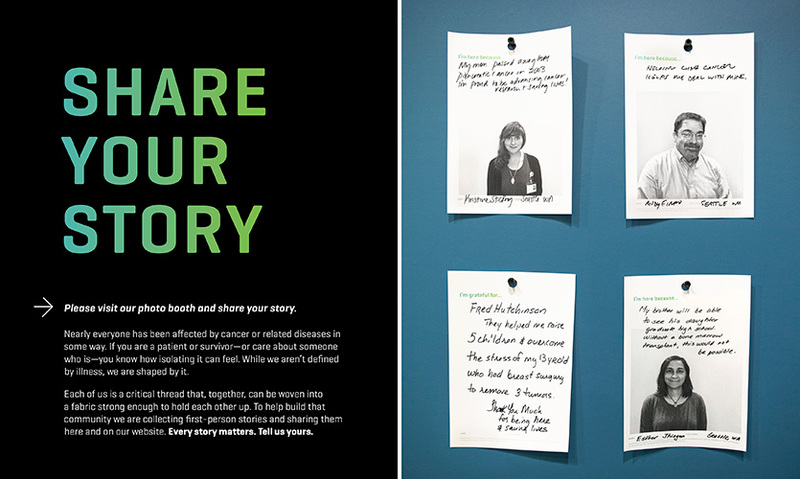 Visitors are able to contribute their image and personal message to a growing collection of moving stories from cancer survivors, families, staff and researchers. Everyone has been touched in some way by cancer, and this space is designed to both provide community and encouragement. A revolving selection of these stories can be viewed online, connecting patients, families, researchers and supporters around the globe. Within days of opening, the walls of the visitor center were covered with hundreds of personal stories and testimonials. The space has become the starting point for any visit to campus, as well as a contemplative space where staff and researchers can pause to reflect and become inspired by the groundbreaking, lifesaving work going on around them at Fred Hutchinson Cancer Research Center. "This project thoughtfully integrates the scientific information and human interaction. It is calming, balanced and fresh. The designers created a comfortable space for visitors personal stories to shine. 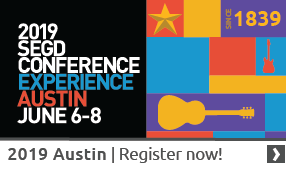 Color usage and typography enhance the experience and welcome you in." "This exhibition is a beautiful example of a solution that's elegant in both concept and execution. Implementing the interactive photo experience allows the life-saving research to connect in a meaningful, story-driven way. It's one thing to read about technological innovations, but to listen to the families and friends who have had their lives directly impacted by said research gives the information a gravity that wouldn't have otherwise existed. I lost my mother to cancer when I was in high school, so to see a wall full of people who have been through similar struggles would certainly be an overwhelmingly powerful, hopeful experience."